His parents Chris Gard and Connie Yates confirmed the news this evening. ENGLISH BABY CHARLIE Gard has died at a London hospice. His parents, Connie Yates and Chris Gard, had fought a lengthy legal battle to allow him to be taken to the United States for treatment for a rare genetic condition. He died exactly one week short of his first birthday. “Our beautiful little boy has gone. We are so proud of you, Charlie,” his mother Yates said in a statement. A court had ordered that the 11-month-old should be moved from hospital to a hospice where his life support would be withdrawn. Supporters around the world donated £1.35 million (€1.5 million) via an online fundraising site to support the family and their efforts to keep Charlie alive. Charlie was born with a rare form of mitochondrial disease that causes progressive muscle weakness, including in key organs such as the heart. He was admitted to hospital at eight weeks old and his condition progressively deteriorated. Charlie’s parents fought a five-month legal battle for him to be taken to the United States for experimental treatment. They lost a series of appeals in British courts and the European Court of Human Rights in Strasbourg. But the boy’s parents gave up their battle last week, saying “time has run out”, after they were shown scans indicating that his condition had deteriorated too much. They then asked for Charlie to be taken to their home for his final days but were overruled by the hospital which said the ventilator keeping him alive was too bulky to fit through their front door. Email “Charlie Gard, the baby at the centre of a legal battle, has died”. 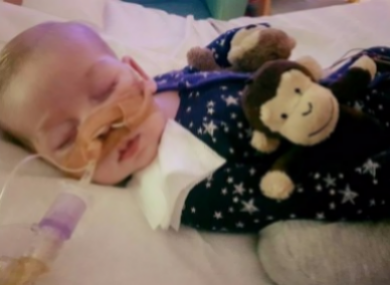 Feedback on “Charlie Gard, the baby at the centre of a legal battle, has died”.